Via TVGuide.com, by Natalie Abrams: After spending the past six seasons keeping his Dark Passenger in the, uh, dark, Dexter's titular character will be forced out of the serial-killing closet in the season premiere. The last we saw Dexter, he had finally delivered his own biblical form of vengeance upon Travis, stabbing him in the closing moments of the finale. Unfortunately, Dexter wasn't alone in that church, as Deb, planning to profess her love to her brother, walked in on him driving a knife into Travis. So what does this mean for Dexter now? TVGuide.com turned to showrunner Scott Buck to get the scoop on how this reveal changes everything in the coming season, from his relationship with Deb to whom else might be coming after him. Somebody finally knows Dexter's secret! Will we see a more vulnerable side to him this season? How does this information change Deb? Buck: It's like a slap across the face because the person who she's turned to her whole life, and thinks she has known so closely her whole life, is suddenly revealed to be someone who's very different in a lot of ways. It upends her whole world. Deb was going to the church with the specific goal to tell Dexter that she's in love with him. Will those feelings be addressed at some point? Has she lost those feelings or is there a part of her that hates herself because she hasn't? Buck: It's a little bit of all of those. The feelings certainly don't disappear. If you're truly in love with someone, just because you discover something horrible about that person, [that] doesn't make you stop loving them. It'll be interesting for people to see what her first response is to that and how that will change over the course of the season as well. What's also interesting about this is ... in all these previous seasons, it was Dexter with the big secret and now suddenly Deb has the big secret. Not quite as big, but considerable. Executive producer Sara Colleton mentioned to us that LaGuerta (Lauren Velez) will reopen the Bay Harbor Butcher case. What can you tell us about that? Buck: In the opening episode, LaGuerta finds a blood slide and the only other instance that we've seen bloodslides like that were those that supposedly belonged to Doakes (Erik King), the Bay Harbor Butcher, but we also know that Doakes stole those slides from Dexter. LaGuerta has always had a very close relationship with Doakes. She never believed he was guilty of being the Bay Harbor Butcher, so this is going to cause her to, in her own private, personal under-the-radar war, to re-open the investigation to find out exactly what this could possibly mean. So Dexter has Deb breathing down his neck, LaGuerta breathing down his neck and Louis (Josh Cooke) breathing down his neck. How is he going to balance that? Buck: It's not just that. As we introduce in Episode 1, he kills someone who is a significant part of Isaac's (Ray Stevenson) organization. That also tees him off to find out what happened to this person, who killed this person. So Ray's also onto Dexter all throughout this season. It's often where we see Dexter at his best, when he's trying to juggle so many things. We also played a couple seasons in a row where no one was onto Dexter, so this is the season where it all comes crashing in on him. Going back to Louis, he sent the hand to Dexter. What will we see for the culmination of where this is heading? Buck: When Dexter receives that hand in his apartment, and when he looks at that, he has no clue what that means. How did this get into his apartment? That was the hand that belonged to his brother, Rudy (Christian Camargo), who's the Ice Truck Killer, so Dexter is wondering: Is there someone else onto me? If so, why did this person send this to me? What does this mean? In so many ways, it becomes more vital than even Deb because he can at least control Deb, whereas this is some great unknown out there and he has no idea what it means. For the first few episodes, that becomes a big drive to find out where this came from and what it could possibly mean. He's always been suspicious of Louis, so that relationship is heightened already. Will that just be volatile when the show returns? Buck: It will play very big in the first four episodes, yes. It will play out throughout the season, but that's where we'll hit it really big. Will Dexter be more careful now that Deb knows his secret? Buck: You would think Dexter would be more careful in this situation, but the way that Dexter has typically dealt with stress, and the way that he has handled any kind of emergency in his life, is to try to regain control. The way Dexter typically knows how to regain control is to find the calm of a kill room. Yes, he should put the knives down and walk away from them for a while, but that's just not what the voice inside of him is saying to do at this point. Is his sister finding out not enough to change Dexter? Buck: Dexter is who he is. I don't know that Dexter is capable of change. We've actually seen him slowly evolve throughout the series, but to suddenly stop becoming a serial killer, it just doesn't seem to be something he is capable of. What can you tell us about Yvonne Strahovski's character? Buck: She plays a character named Hannah McKay, who, when she was 15 years old, hit the road with Wayne Randall on what ended up being a crime spree. He killed a number of people on the way before they were finally arrested. She was arrested as well. Because he did all the killing, she was sent to juvenile hall for six years and was released at the age of 21, and has since then lived a very calm, reclusive life. But with the reemergence of Wayne Randall, who has been in prison all these years, now saying that there are actually more bodies out there that he can lead the police to, the case becomes news again, and it forces Hannah to come out in a way that she had much preferred not to. 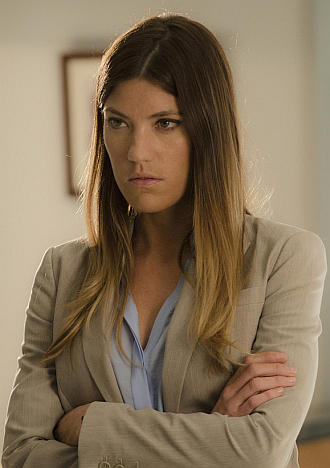 Because of that, she will cross paths with Dexter and it becomes very volatile in an interesting way. You're saying she's trying to life a quiet life, but intersecting with a serial killer probably doesn't help. Buck: No, not in the least. [Laughs] They're not particularly good for each other, but at the same time, they're the best possible thing for each other. They find themselves drawn to each other in a way that they both wish they weren't.